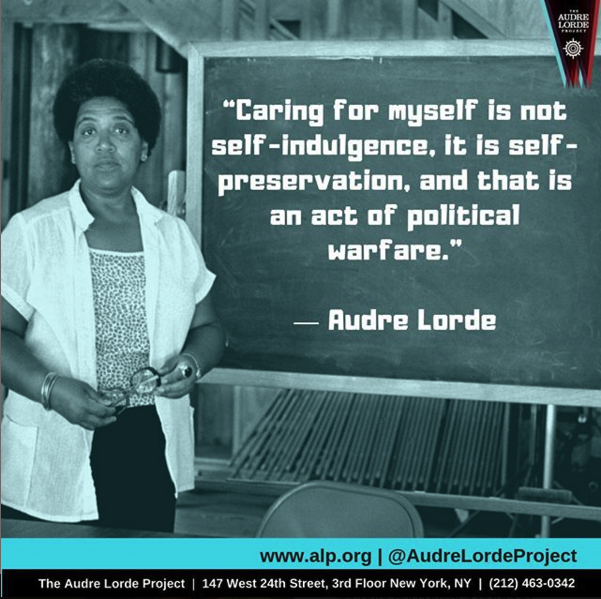 Join me at The Audre Lorde Project’s Community Care Day at The People’s Forum 320 W. 37th St, New York, NY 10018 this Friday January 18th from 6-9 pm. Community Care Day is an evening event where we are inviting folks to join us in deepening our collective community care. We will build together by sharing food, getting to know each other and sharing care and healing strategies. Join the 3rd Space Program! We will be offering workshops that will teach you different ways to care for yourself and others, get some healing from our body and energy work practitioners and get some grub, community, laughter and love! Sharing space is healing, holding space for each other and having a place to go to where you can be your full self and uplifted is what we are creating – join us at Community Care Day – resilience happens through collective action, recognition and love. Come learn and share skills and resources, eat some food, make some art, and generate joy. This is a time to be still, be loving, be cared for and caring. Resilience requires community Come to ALP’s Community Care Day! This event is by and for Lesbian, Gay Bisexual, Two Spirit, Trans and Gender Non-Conforming folks who are Black, Indigenous and People of Color. The 3rd Space Program is made up of community members who identify and are invested in sustainable care for our people that is centered in a deep, loving and radical sense of community, that moves away from the isolation and disposability that medical institutions and capitalism impose on us and instead uplifts and creates the strategies within us and from our lineage that have kept us thriving and resilient as black and indigenous, people of color, queer, trans and gender non-conforming folx.